The University of London Observatory at Mill Hill in London is an astronomical teaching observatory, part of the Department of Physics and Astronomy at University College London.The Observatory was opened on 8 October 1929 by the then Astronomer Royal Frank Watson Dyson, initially to house the 24-inch reflector from Dr W.E. Wilson's observatory at Daramona, Ireland, which was donated to the University of London after his death. An 8-inch refractor was installed in 1931 following its donation to the University by H.R. Fry of Barnett the previous year. In July 1938, the Observatory was further expanded to accommodate the 24-inch/18-inch twin refractor that had been removed from the Radcliffe Observatory at Oxford in 1934.The Wilson telescope was retired in 1974 (to the Merseyside Museums), and was replaced the following year with a new 24-inch Ritchey-Chrétien Cassegrain reflector which was named after the former director of the Observatory, Professor C.W. Allen. 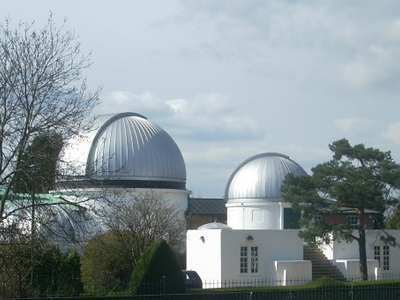 In addition to the Fry, Radcliffe, and Wilson telescopes, two Celestron 14-inch Schmidt-Cassegrain telescopes are housed in permanent domes, and there are several smaller free-standing telescopes.The observatory's primary purpose is to provide UCL undergraduates with training in practical astrophysical techniques and data-handling.There is also a research programme, involving students in observing transits of extrasolar planets. Here's the our members favorite photos of "Observatories in London". Upload your photo of University Of London Observatory!